Barcelona’s coach, Josep Guardiola wasn’t in the mood in commenting about his future as his mind is simply focused on the Catalan’s upcoming clash against Atletico Madrid, which could potentially be another troubling game for the defending champion. Guadiola acknowledged the improvement that Atletico made under the new reign of Diego Simeone and urged his team to play their best game in order to get three points at Vicente Calderon. Simeone has changed the dynamic [of the team]. (Atletico) has a soul, they are intense, aggressive … all of the players work and put in a strong effort. You watch the team, it’s an expression of their manager. His strong and intense take on the game when he was a footballer has been transmitted to his team [we must] try and play in a way that favours this team. 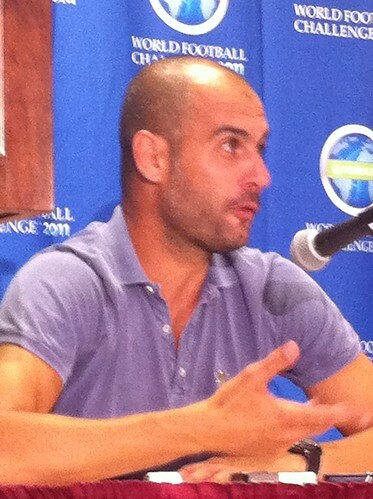 We’ll have little time to think, we’ll have to be alert, brilliant, and skilled,: Guardiola stated. Having already lost several points in their away games in La Liga this season, it’s normal that Guardiola has some worries ahead of their game against Atletico this Sunday, not to mention the fact that the Madrid based side are on a good form at the moment. With the obligation to chase their rival, Real Madrid, who are already 10 points ahead, the Catalan squad must get things right a game at the time, while hoping that Jose Mourinho’s team would be slipping. Guardiola added that the situation is getting really delicate indeed for Barca in La Liga as they must now try to win every matches while hoping that their rival losing some points, something which hasn’t really happen in the last couple seasons. There’s still lots of games to play but it’s obviously a difficult task for the Catalan outfit in chasing Los Blancos, especially should Mourinho’s team kept their current excellent form in the league. When a team is 10 points behind the leaders the mindset isn’t to mount a comeback. Our plan is to be calm and try to win the match. We can’t focus on anything else. In this house there is always pressure but they [they players] know that they can’t give up. The Liga is complicated, we have to take it a game at a time,” Guardiola added. Meanwhile, stating a little comment regarding several media question about his future, Guardiola simply said that he is tired with the press affection of it and promised to inform things when there’s an update. The tactician has been closely linked with a move to Inter Milan, who are in desperate need of new coach, after things doesn’t really happening for the Nerazzurri, who are in the verge of firing their current tactician, Claudio Ranieri, after such a disappointing run of results. [My contract] is [becoming] a tiresome issue. “When there are updates, you will know,” revealed Guardiola.